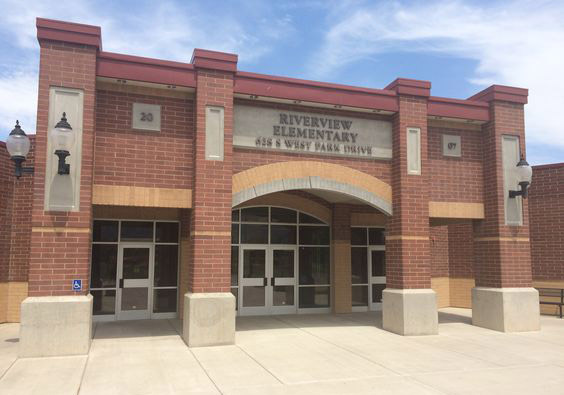 Last night, parents from Riverview were invited to attend an evening with classes and information. The classes and booths were all about how to protect their families by placing filters on their devices, learning about community programs, and learning about how to talk to children about things they may encounter online. This was a wonderful evening of resources that we look forward to carrying on as a tradition at Riverview. White Ribbon Week has been another success! Tomorrow it wraps up with students wearing as much white as possible, and the drawing of prizes for participating in the activities. We give a special thanks to Whitney Permann and all of those in the PTA who have helped put on a wonderful White Ribbon Week! Get ready for White Ribbon Week! 5th Graders produced another fabulous Wax Museum this year! The rest of the school was able to visit the museum and learn about famous people from history this morning. Parents and families were able to attend tonight. From Annie Oakley to Elvis Presley, 5th graders researched and summarized the lives of those who helped shape history. There was a lot to learn from these students and their research. A lot of preparation went into this event. Thank you for a great show, 5th grade! Will We See the Teachers' Talents? Breaking News! There are only a few more days to get your cookie dough orders in for our school fundraiser. As part of the incentive to place orders, students could potentially see their teachers show off their talents in a talent show! So, get going and sell! Let's see what talent the teachers have at Riverview! Every dollar helps out our school. Remember, no door-to-door sales, please. Good luck and have fun! Bring your forms and money on Friday, February 1st. These cookie are delicious and easy to make, so make sure grandma and grandpa get a tub! Hey! We Are 100 Days Wiser! Happy 100th Day of School from Kindergarten, First, and Second Grades! 10 kindergartners, with 10 fingers each, equals 100! Aren't they cute!? 2nd Graders were asked to build a cube using toothpicks and marshmallows. Not only were they excited to work with marshmallows, they quickly learned that the marshmallows and toothpicks would help them determine how many vertices and edges a cube has. One can tell by the looks on their faces that they had a great time and were very pleased with what they learned! Mrs. Nixon and Mrs. Thomson had a debate tournament in 5th grade. Over the course of two weeks, students were required to create cases for both sides of a controversial topic, and practice delivering their speeches. The event culminated in a single-elimination tournament between the two classes. 1st place went to Ryan and Moises, 2nd Place to Brooklynn and Dakota, 3rd place went to Bronte and Justice. Congratulations!! The Jon. M. Huntsman Family is proud to sponsor the 21st Annual Huntsman Awards for Excellence in Education. This morning, after the school had gathered together for the second grade program, Mrs. Muirbrook received a call from Sparkle the Elf explaining that Santa needed to land somewhere, and QUICK! She said he could make a stop right there at Riverview. Students heard bumps on the roof as Santa landed his sleigh safely. He came in to say hello to all of the students. He reminded them that Christmas is a special time and to give their parents extra hugs and love. He told everyone to continue being good, answered some questions, and then said goodbye, as he is very busy. Everyone again heard the bumps and bangs of the reindeer and sleigh taking off. It was a magical morning at Riverview! We've been good this year, Santa! Come back and see us again soon! What Happens When You Read? In just 3 weeks, our first graders read 5,105 books! The goal to earn a Polar Express party was for each student to read 15 books, or 2,079 books for the entire grade! That goal was easily surpassed by these readers! The first graders were treated to their party and had a great time. Mrs. Olson promised her class that she would dress up if their students read, and she kept her promise as she showed up today as a Grinch character. Way to read, First Grade! Students pictured are the top two readers from each first grade class.